Million dollar views to Rottnest island. The ever-changing magnificent harbour and ocean views will instantly captivate you, there is always something interesting, fascinating and inspiring to watch.! These apartments are equipped with every little thing you would need for a week, a month or a year. Fully equipped kitchen with full oven and cook top, microwave, fridge freezer and lots of culinary items. Bathroom with shower and hand-basin. TV DVD and music system. Queen bed with quality linen provided. Free parking for one car. This apartment is located in a quiet, well run block an easy 8 minute walk from the centre of the historic port city. The free CAT passes nearby every 10 minutes or so.This service circumnavigates Fremantle and drops off at every place of interest including the train station and Rottnest Ferry. Enjoy 180 ocean views over the harbour with wonderful sunsets.Bring your binoculars and be entertained by the constant activity of the busy port. The parklands of the war memorial make a picturesque backdrop. On stormy nights you can enjoy a glass of red and watch as the weather rolls in over the ocean from the wide window, which frames the vista like a living landscape or capture the last of the sun's rays as it disappears for the day beyond the horizon. 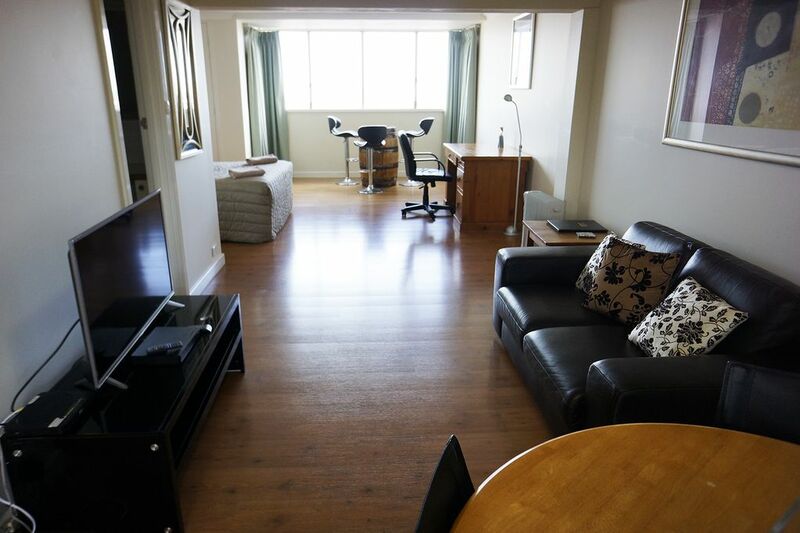 The apartment is 30km from the domestic and international airports via the Leach Highway. Hire a car or get a cab at a cost of approximately $65.There is an airport shuttle available on costing from $25 for 1 person to $40 for 3 people. How many apartments are available? We have 15 studio apartments. How far is the international and domestic airports? Both are approximately 35km. Access the Leach highway, takes you all the way to Fremantle. Is there a shuttle service available from the airport? How much will a cab cost from the airport? A standard cab will cost approximately $65. How far from the Esplanade hotel? Lisdoonan is located 1.6 kms east of the Esplanade. Centre of Fremantle is approximately 1km. We have off street parking for one car. We can offer a weekly service at a negotiated cost. Are there food shops nearby? The nearest shopping centre is 1km. What distance to the Rottnest Ferry? The ferry at Victoria quay is 1.5km. The free cat bus drops off at that point. How far from Perth city? Fremantle is located 35km south of Perth city. Perth city is accessible by train , bus or ferry. The Leisure centre which is located just 850 metres from the apartment has a 50 metre outdoor pool and a 25 metre indoor pool for your enjoyment. Constructed by convicts between 1851 and 1855 this daunting building was in use as a maximum security prison until 1991. It is open from 10 to 6 every day. A candlelit tour is available a couple of times a week. Houses two of Fremantles most significant cultural attractions. This magnificent neo-gothic building was constructed by convicts in the 1860s to serve as the colonys first lunatic asylum Today the centre offers exhibitions and creative arts. Located behind the apartment block. This memorial reserve is Fremantles heritage and National Trust listed War memorial. The reserve has magnificent ocean views and is a short stroll from central Fremantle. A special feature of Fremantle is its maritime atmosphere and this can best be appreciated on a stroll around Fishing Boat Harbour. This is a working harbour all year round and you may see fresh seafood being offloaded from the fishing boats ready for export or the local market. There are many waterfront restaurants with spectacular ocean views to be enjoyed at Fishing Boat Harbour. Hop on a tram for a guided tour of Fremantle’s best attractions with interesting and informative commentary. Book a history tour, waterfront or even a ghostly tour. Over 100 stalls with unique gifts and souvenirs, local arts and crafts and international food hall. Located in a restored warehouse on Fremantle’s Victoria Quay wharf. When you have arrived in Fremantle the easiest way to get around is with the popular Fremantle CAT service. CAT buses complete a circuit of the city stopping at popular places of interest offering easy access to major attractions and venues. The CAT bus runs every 10 minutes 7 days a week between 7.30am and 6.30pm on weekdays and 10am and 6.30 on weekends. PLEASE BE ADVISED THAT THERE IS A LIFT UPGRADE AT THE COMPLEX WORK WILL BE CARRIED OUT DURING WEEKDAY WORK HOURS WHICH WILL COMMENCE ON THE 2ND NOVEMBER 2018 - 18TH JANUARY 2019. WE REALISE THIS WILL BE A DISRUPTION FOR RESIDENTS AT THE COMPLEX AND WE APOLOGISE FOR ANY INCONVENIENCE CAUSED. THERE ARE STAIRS AT THE COMPLEX. Oeean view is good even though to distance, kitchen and toilet are clean and tidy sofa beds is very old and not so clean same as carpet, room service once a week and not so appropriate. Thank you for the feedback we always appreciate it. We are disappointed that you rated us as a 2 star. Are you sure that you are not making a mistake with another property you may have stay at? We do not supply a sofa bed but a reasonably new good quality queen bed at the apartment. All linen and towels are commercial and professionally laundered. We offer a service once per week for guests staying more than 7 nights. The service was offered to you on 4 occasions but you accepted only the clean linen and towels. We have great respect for our guests privacy and hence did not insist on doing a service. We wish your daughter well in her studies in Fremantle Thank you for staying with us. I didn't stay in the intended property due to maintenance but still stayed at a Callan Apartments property (in Arundel St). Mary contacted me re the maintenance and offered several options and let me choose the one that suited me. The property was in a great location, close to town and with a Blue CAT stop right across the road. Although not as upmarket as you would expect from a Hotel, it had everything that I needed and suited me better than a hotel given the nature of my stay. The lower overall cost (given I needed a car park too) far outweighed any benefits of getting the extra "luxuries" you would get in a hotel. Overall I would not hesitate to recommend or stay again. Any questions I had Mary was more than happy to answer quickly. Very convenient, nicely fitted out. A uncomplicated base for a great holiday in Perth. A high table and chairs in the window like in the other Callan apartments in the block would be great!